Zen Mountain Monastery is an American Zen Buddhist monastery and training center. Its location in the Catskill Mountains of upstate New York creates an atmosphere conducive to self-study and introspection. 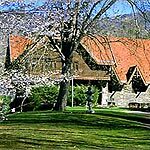 Zen Mountain serves monastics living at the monastery full time as well as lay practitioners who visit the monastery for special retreats or whose practice is supported through one of the affiliate centers/groups of the Society of Mountains and Rivers.